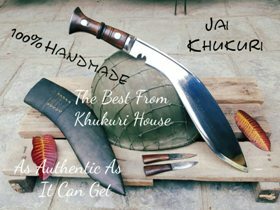 The latest from the stable of K.H, an inspired Khukuri based on MK2 design and named under the Heroics acts of Legendary VC holder, "Lal Bahadur Thapa"
Hi Carbon 5160 Hardened Steel, Indian Rosewood handle, Water buffalo leather case, 1 x small knife "Karda" and 1 x sharpener "Chakmak"
His report read "Enemies gun destroyed, Prisoner taken one, Enemies killed Ten, Own casualties Nil, Ammunition expenditure "Nil", such was the swiftness and effortless action of Legendary VC Lal bahadur Thapa on the 5th/6th April 1943 in Rass-es-Zouai, Tunisia, taking command of two sections, made his first contact with the enemy at the foot of a pathway winding up a narrow cleft which was thickly studded with enemy posts. The garrison of the out-posts were all killed by Thapa and his men, by khukuri and the next machine-gun posts were dealt with similarly. Thapa then continued to fight his way up the bullet-swept approaches to the crest where he and the riflemen with him killed four - the rest fled. Thus secured, advance by the whole division was made possible. This bravery won him the VC and now into the History book among many who it have won too and now surely deserve his name of be followed and remembered. latest Khukuri, which is a Inspired Khukuri of MK2 under his name, the "Khukuri Lal Bdr Thapa " and keep his Legend to go On and On. Jai "Lal Bdr Thapa" and Jai "Khukuri Lal Bdr Thapa"
Own one and lets keep his Legend alive!